Cirka’s team has been on the road to the January Furniture Show at the NEC Birmingham, catching up with our client La Z Boy to which the team, designed, developed and installed their “Gallery” concept throughout 2017, with more to come in 2018. 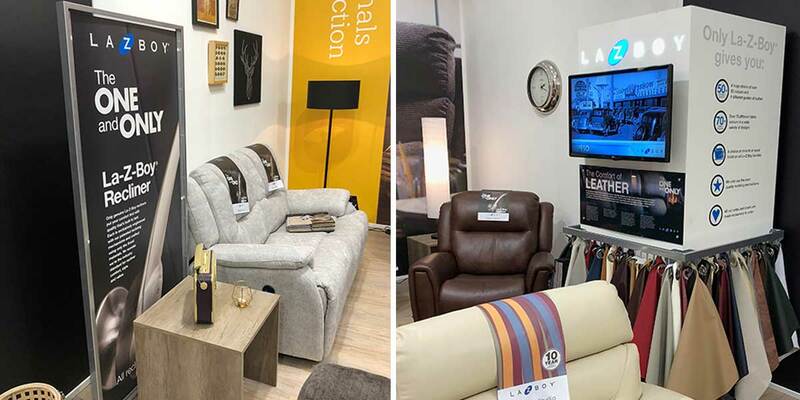 The senior team at LaZboy have already seen a large jump in interest, retail visibility and importantly sales as a result of the new retail galleys designed by Cirka and a supporting proactive advertising strategy. The Cirka team had a great day meeting clients new and existing and the design teams are already busy converting some of these conversations into the some great retail display designs. The shows runs until the 24th of January, so its not too late to drop in on the LazyBoy team in Hall 5, you can’t miss them!